Image Shows the ACT CoVe with 4 Power Outlets and 2 USB Charging Ports and 1 Technology Plate This product can be modified to include up to 6 electric outlets and multiple technology access ports. The new ACT-CoVe is a versatile power and charging solution designed to seamlessly integrate power, USB charging ports, and data capabilities into a variety of spaces. Available in an array of configurations and flexible mounting options, the USB Charging Module can easily change any area into a powerful multifunctional space. Ideal applications include collaborative lounge furniture, desking, tables, and soft sided seating. Sky is the Limit - Over 20 configurations mix power, USB, and data with five sleek finishes to meet all individual project requirements. 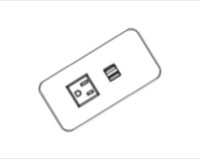 Enhanced USB Charging Technology - Powered USB ports now charge your favorite devices while in use. Spill Resistant Receptacles - Protect against unexpected spill hazards and provide freedom to mount the ACT-CoVe face up in table surfaces. Power Below the Worksurface - Convenience receptacles on select models provide additional power outlets for stationary accessories. Rotated Receptacle Orientation - Receptacles are strategically positioned to optimize the surface area of each unit accommodating large and small device plugs..
Two mounting styles (clamp or screw mount). Mounts to surface thicknesses: .75"-1.25"
Rugged powder coat, and aluminum anodize finishes for lasting durability. Available in power, data, and USB configurations ranging from 1 outlet with 2 USB ports, through 6 outlets with a customizable data plate, and 4 USB ports. Not quite what you need? We can customize this to meet your requirements. Call our design specialists at 877-878-8770.